Researchers: Mahdi Motagh, Mahmud Haghshenas Haghighi, and Hans-Ulrich Wetzel, GFZ German Research Center for Geosciences; Abbas Bahroudi, University of Tehran; Sergey Samsonov, Natural Resources Canada; and Eric Fielding, Jet Propulsion Laboratory. The active plate boundary marked by the Zagros Mountains has high seismicity, a complex fold and fault system and significant hydrocarbon reserves. 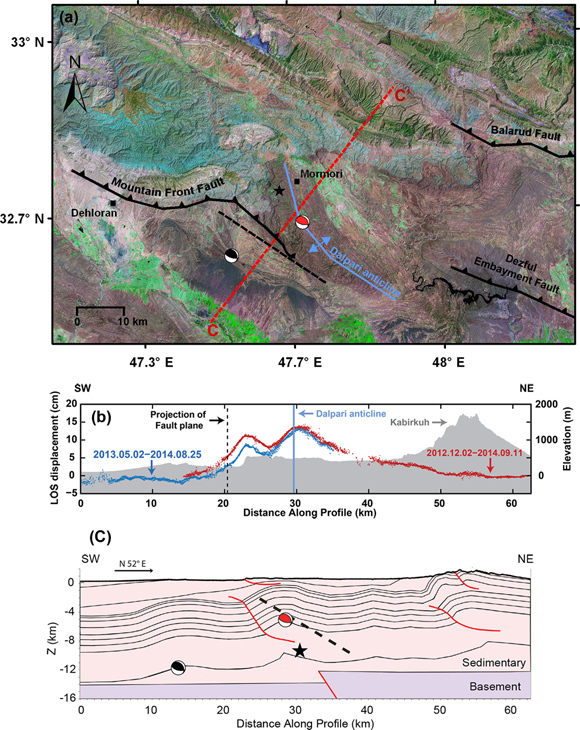 Analysis of the 18 August 2014 Mw 6.2 Mormori, Iran earthquake with synthetic aperture radar (SAR) satellite imagery shows the event occurred along a shallow, blind thrust fault in the softer sediments above firmer bedrock. This supports the hypothesis of thin crust that is shortening to the west of the mountains as part of the Dalpari fold structure. Understanding all of the structure along one of the most active plate boundaries in the world, will improve our knowledge of fault systems and earthquake dynamics. The Zagros Mountains are a seismically active fold and thrust belt in southwestern Iran that mark part of the collision between the Eurasian and Arabian plates. Observing the deformation attributed to the many earthquakes along the mountain belt would provide information about how continental crust accommodates compression along a plate boundary. Unfortunately with few seismic or geodetic instruments deployed in the mountains, it is hard to study this active tectonic regime. Interferometric synthetic aperture radar (InSAR) from satellites provides information about the amount and direction of motion of the surface caused by earthquakes. The dry and barren Zagros Mountains are optimal for this type of imagery because there is little vegetation or complex atmospheric conditions to confuse the comparison of SAR images over time. 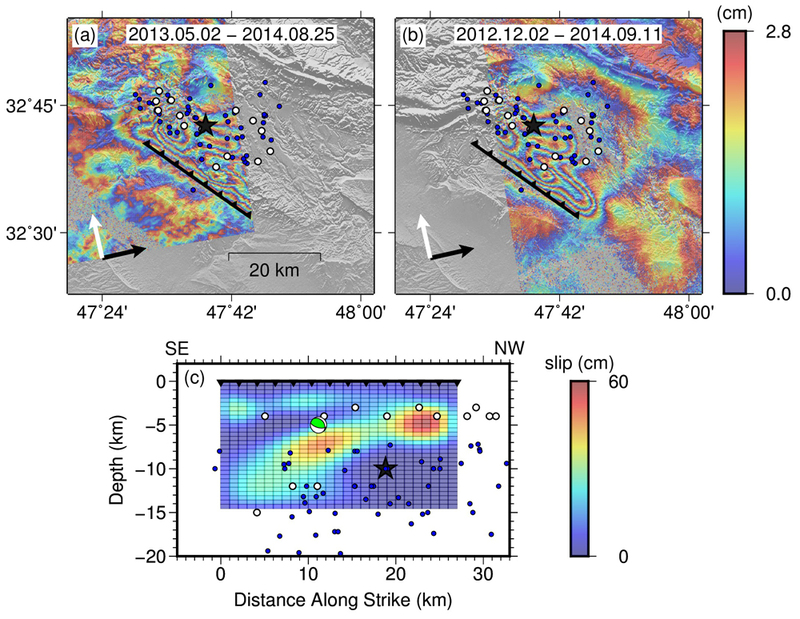 Here the authors use two ascending RADARSAT-2 interferograms to determine the surface motion from the earthquake. The imagery is compared to geological and seismic data to better understand this event and the geodynamics of the boundary. The satellite imagery captures the following characteristics of the earthquake and the fault zone. The region uplifted during the event, extends south from the epicenter over 31 kilometers northwest-southeast and 17 kilometers northeast-southwest. The fault plane is about 27 kilometers long and 19 kilometers wide. A shallow northern patch slipped about 60 centimeters and a deeper southern patch slipped about 45 centimeters during the earthquake. Taken together the imagery and other geologic/seismic data suggest that the main slip was constrained to the shallow sedimentary rocks at a depth of 3 to 10 kilometers on a blind thrust fault (i.e., buried beneath the surface) and the shallow fault is probably not connected to a deeper basement fault structure. The shallow slip fits with growth of a local fold, the Dalpari anticline, and the compression of a relatively thin crust to the west of the mountains. Mahdi Motagh, Abbas Bahroudi, Mahmud Haghshenas Haghighi, Sergey Samsonov, Eric Fielding, and Hans‐Ulrich Wetzel, The 18 August 2014 Mw 6.2 Mormori, Iran, Earthquake: A Thin‐Skinned Faulting in the Zagros Mountain Inferred from InSAR Measurements, Seismological Research Letters, May/June 2015, v. 86, p. 775-782, First published on April 15, 2015, doi:10.1785/0220140222.